While I’m in Colorado I’m staying with an old friend in Longmont. Celeste Montoya is a member of the faculty at the University of Colorado-Boulder. She graciously volunteered to host me and also show me around Boulder and its environs. I flew in yesterday morning, and after I drove to her home in Longmont we spent the afternoon on a little tour of some of the flood ravaged areas near her home (as the week progresses, I’ll see other sites as well). While I’m still settling in and getting my feet on the ground here, I did want to share some of what I saw yesterday. 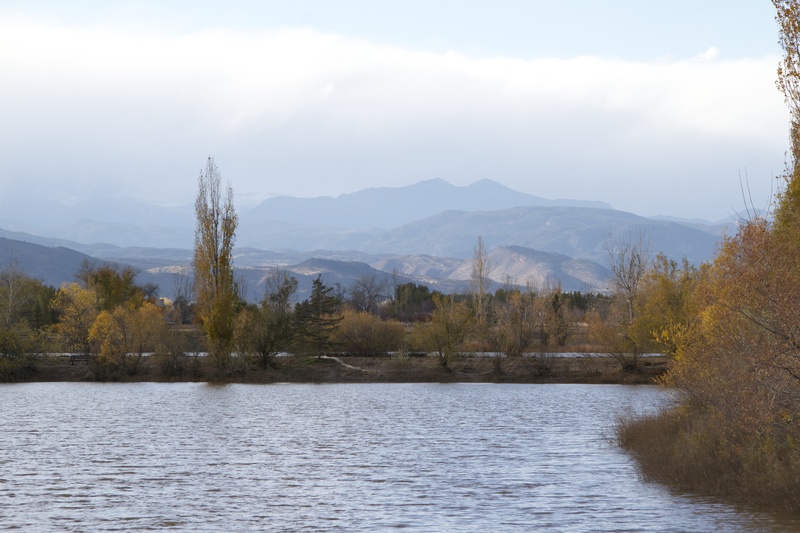 Longmont was extensively flooded. Some of the best photos of the flooding were posted at the Huffington Post here. 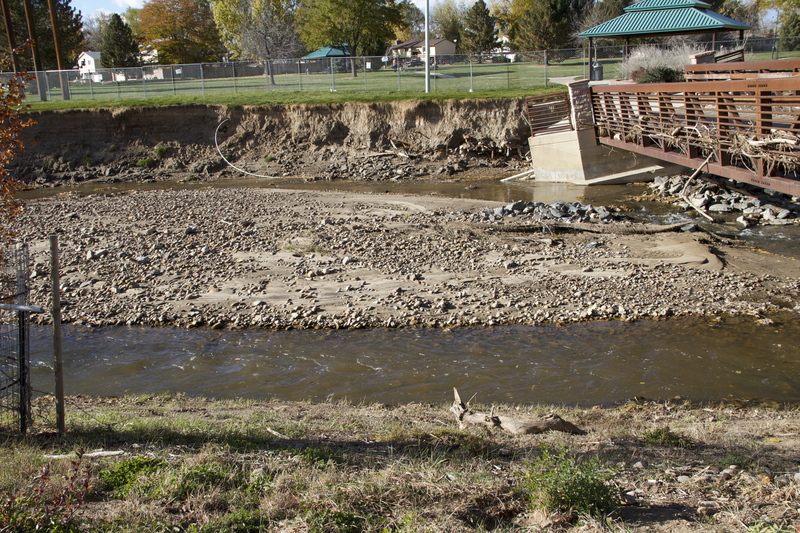 The city was nearly cut in two when the St. Vrain Creek (known locally as the St. Vrain River) swelled dramatically and caused damage throughout the area. Currently, clean up is well underway. 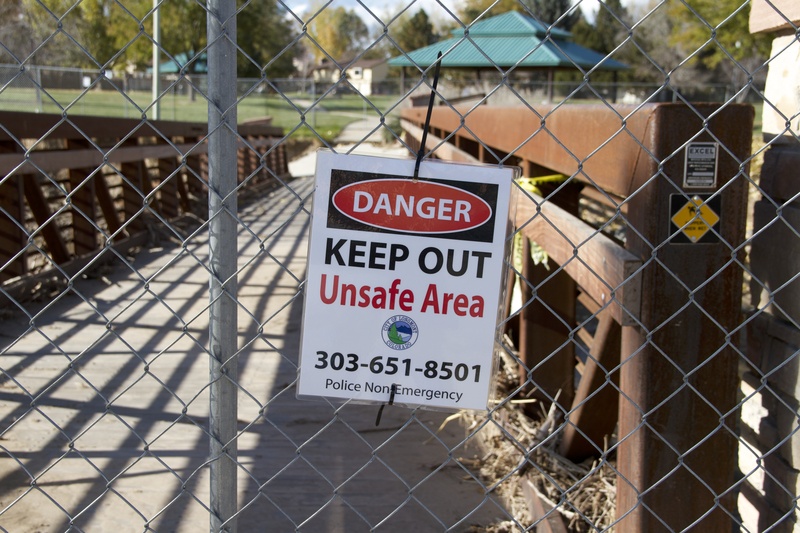 There are several areas, however, that remain closed to the public, fenced off with signs. 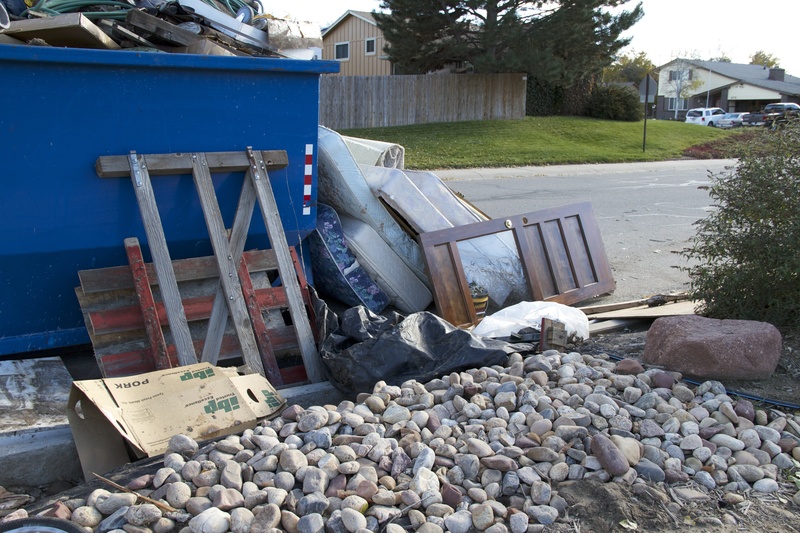 We also saw a few dumpsters here and there like the one below. Some homes were damaged in the area, though we did not see many indicators of that where we were yesterday. 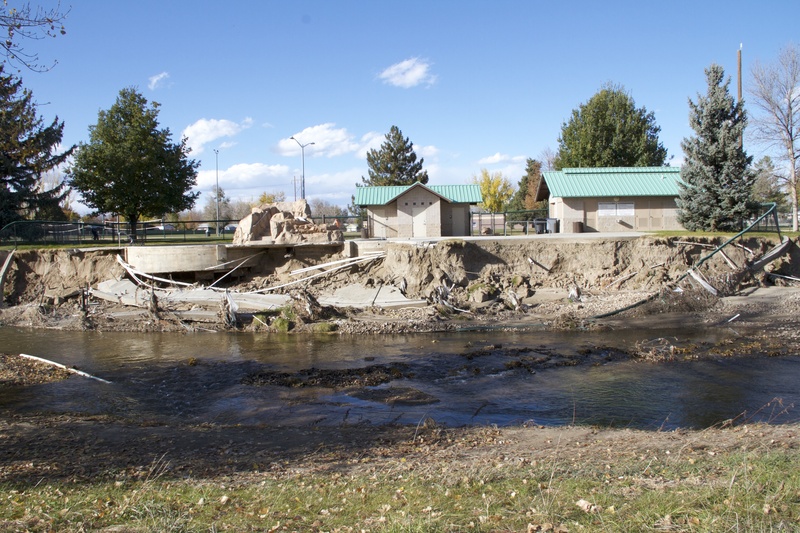 There was extensive damage in neighboring Lyons, where the confluence of the North St. Vrain and South St. Vrain creeks, forming the creek that meanders down the mountains and into Longmont. The St. Vrain is critical in the drainage of both the foothills around Boulder and the Colorado Piedmont. Lyons sits at that confluence. Some of its damage was covered by the Denver Post here. I don’t know if I’ll be able to get up to Lyons since several of the roads remain closed to all but residents. 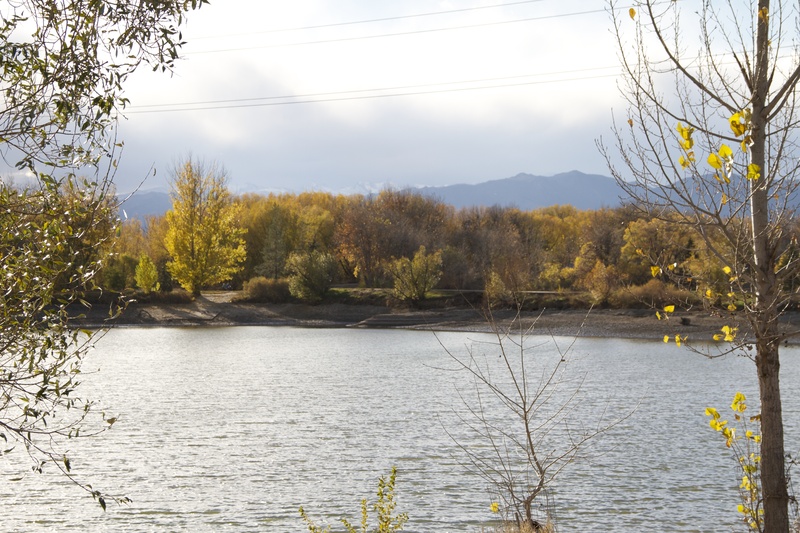 Many of the areas we were able to access were near the St. Vrain Greenway Recreational Trail. Celeste tells me the trail has been a favorite area for family walks, bicycle outings, etc. Various parks and other areas along the river provide the community with places for picnics, music events, and places for neighbors to meet and socialize. As is often the case with greenway spaces, the purpose of creating the trail itself was to provide a multi-use, recreational trail. However, there’s more to the area than that. The trail runs through the St. Vrain Corridor, an area that encompasses the 6 1/2 mile stretch from Lyons to Longmont and is 1-2 miles wide. It includes the creek and its riparian areas, which are habitat for a lot of wildlife. The corridor includes agricultural land that has been designated as “of statewide importance”, mineral resources and, along the river in some of the riparian lands, critical habitat for threatened species. The greenway, which is inside the corridor (and not the corridor itself), loops through Longmont. If you’re interested, you can get a better sense of the corridor and the trail’s place in it by reading through the St. Vrain Trail Master Plan. Interestingly, the St. Vrain changed its course during the flood. It moved away from the carefully planned flood plains that were supposed to protect neighborhoods and communities. Instead, the creek moved right up into some of the neighborhoods, causing property damage. At this point, one of the recovery questions still left open is whether the creek’s pre-flood course should be restored or whether it should be left where it is now. This is a complicated question, and one I hope to explore further, because it directly impacts the property and homes in the area of the creek’s new path. We also stopped in at Golden Ponds, which is the western terminus for the greenway trail. Much of the area was open yesterday afternoon, though not all of it is accessible to the public. We did some walking around. What struck me most was how relieved so many of the residents of the area were to have this resource opened to the public again. It was a busy place with bikers, people fishing, and others like us, out for a walk (likely encouraged to get out, as we were, by the threat of snow in the forecast and the stormy clouds forming over the mountains). One gentleman stopped us and asked how high we thought the river got in the area. Looking around, we could see signs that the ponds had clearly risen well above their banks (damage to trees and the pond banks themselves) and that the railroad tracks nearby had to be fixed. We chatted briefly about this, all pondering what damage the homeowners who own property that overlooks the ponds had to fix. Whatever damage there had been was not obvious at this point. But what struck me more than anything in that conversation was how relieved people seemed to be to have their public spaces back, to see the repair work well underway, even if some areas were still damaged and those that had been repaired were not quite the way they remember them. 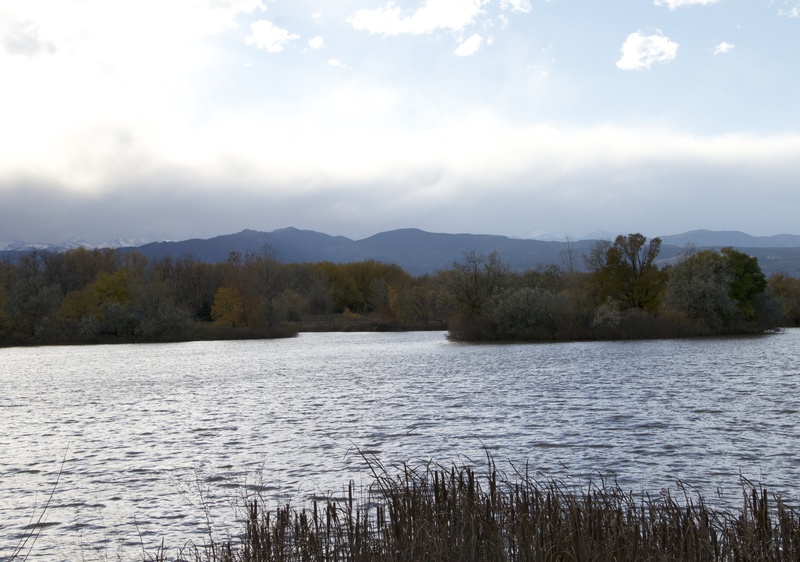 Golden Ponds, the western terminus of the St. Vrain Greenway Trail. 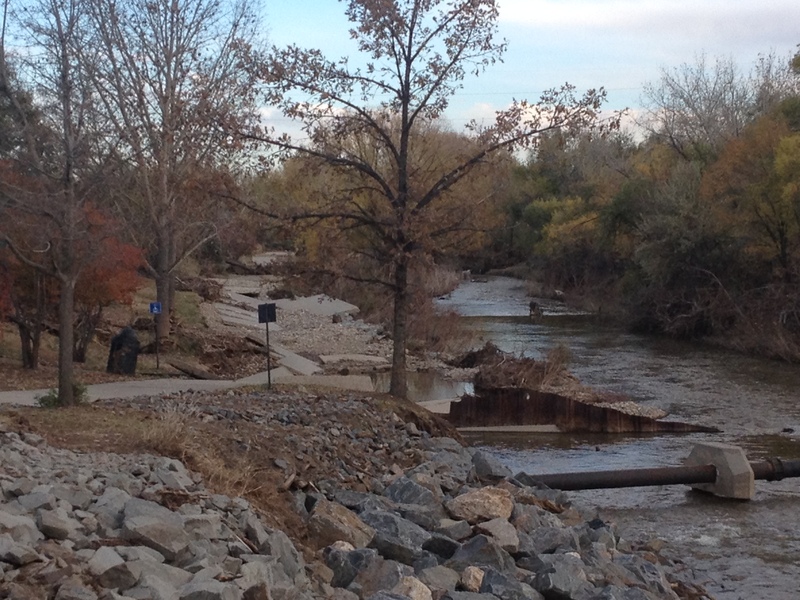 Another waterway, the Left Hand Creek, also swelled and caused damage both in Longmont and in other areas. The Left Hand Creek drains the front range area northwest of Boulder and is a tributary to the St. Vrain. There’s some good video coverage of the Left Hand’s high water damage in Left Hand Creek Canyon here, as well as this YouTube video of the creek in Longmont. As can be seen in the footage around the Internet, the water came up to and just under the bridges. You can get a sense of just how high the water was by paying attention to where the debris and damage remains on some of these bridges. 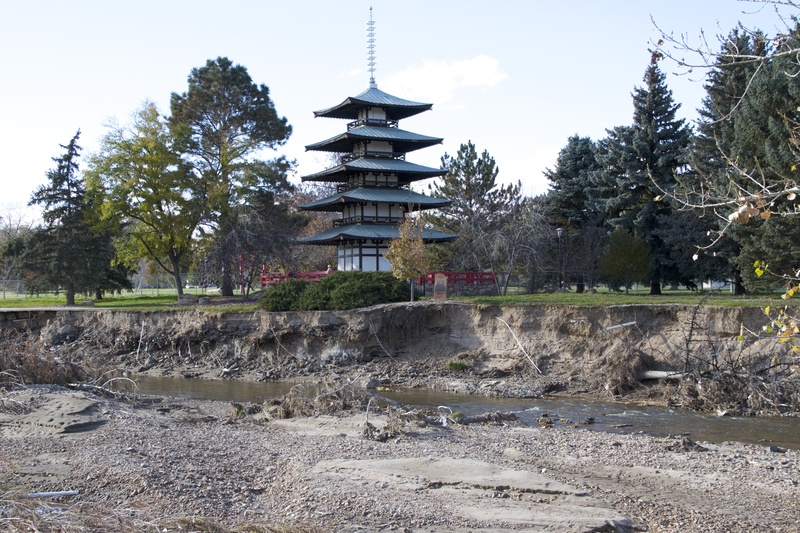 We stopped by Kanemoto Park to get a sense of the force of the water — an area that was both open, not fully repaired, and where the creek bed and buildings provide viewers with some scale. To see what it looked like before, here’s the website describing the pool. Here you can see some other damage in Kanemoto Park. The Tower of Compassion, built in the style of a traditional Japanese structure, provides some sense of scale in the second picture, as does the fence and polls in the first one. We also stopped in at the Left Hand Brewery Company after driving around town and walking through Golden Ponds (ahem). 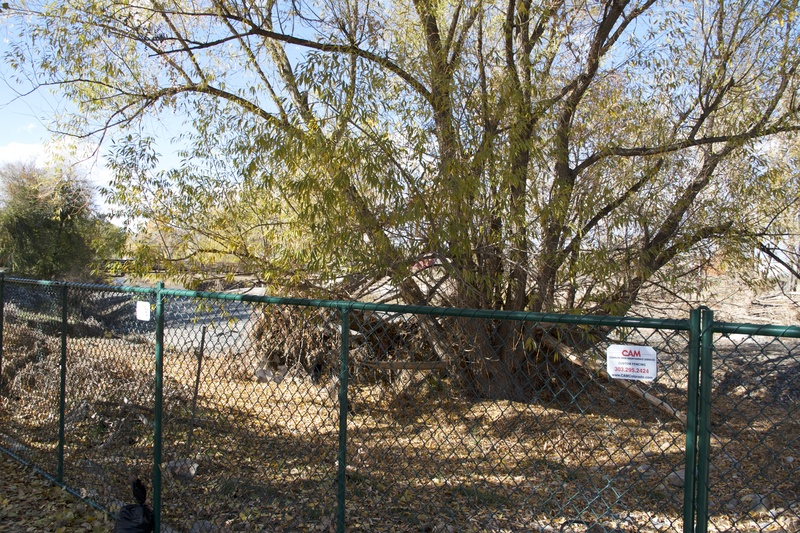 The Left Hand Brewery Company sits along the St. Vrain, and has become famous after using bags of malt to survive the flood. I snapped a couple of iPhone pictures of the St. Vrain as it looks now, directly behind the brewery. You can see that there is still some repair work to be done along the banks of the creek. The brewery is on the left side (out of the picture). There’s a small parking lot between it and the bank of the creek. I’ll be spending time on Tuesday in Boulder (quite possibly watching it snow, but hoping the weather won’t be too bad), and learning more about the issues faced there. I will also be doing some more work on understanding the many issues raised by a course change in a river (i.e., the St. Vrain) and what it means to put it back the way it was, or whether it’s better to let rivers do what they will do.